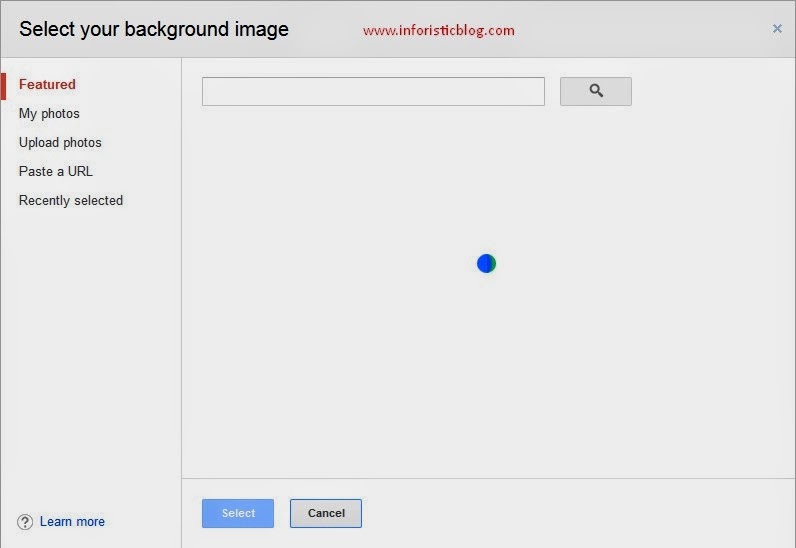 of using your own picture as the background picture of your Gmail. STEP1: Go to the top right corner of your gmail inbox and click the wheel icon "SETTINGS"
STEP 2: From the drop down MENU that shows upon clicking the wheel icon, Click "select a background image" as seen in the screenshot below. STEP 3: After completing the previous step, a window comes up giving you different options to upload your own picture. The options include uploading from a url, Uploading from your computer and so on. Depending on the location of your picture, if you have the url to your picture online you may consider using the Paste a URL tab but if not just click "Upload photos" and select a picture from your computer. STEP 4: After selecting the picture. click "select at the bottom of the window. Your new background should come up in few seconds. I hope this was helpful, your friends may be interested in this tutorial as well. Share it with them via any of our social buttons below and don't forget that your comments and observtions regards this tutorial are highly welcomed.